To Cite: Sarrami A H, Karami M, Sadeghi M, Haddad B. Retropectoral Cystic Echinococcosis: A Case Report, Iran Red Crescent Med J. 2017 ; 19(5):e43119. doi: 10.5812/ircmj.43119. Background: Cystic echinococcosis of soft tissue is rare even in endemic areas. Intermuscular and intramuscular cystic echinococcoses have been occasionally reported in the literature. Case Presentation: A 40-year-old male was referred to the surgery clinic of Alzahra Hospital, Isfahan, Iran, with a swelling over the right side of his chest in September 2015. In physical examination, a nontender soft bulging in depth of the right pectoralis major muscle with no skin manifestation was noticeable. The axial and coronal contrast-enhanced CT scan showed a multicystic mass lesion between the right pectoralis major and minor muscles with extension beneath the pectoralis minor muscle. The patient underwent a surgery for resection of the mass. After dissection of the pectoralis major fascia, a large cystic mass was visualized just beneath the muscle with some adhesion to the chest wall. Histopatholgic study of the surgical specimen also revealed cystic echinococcosis. Conclusions: This case reveals that cystic echinococcosis should be considered in differential diagnoses of any chest wall swelling. Cystic echinococcosis (CE) continues to be a common health problem in endemic countries. It is a zoonotic parasitic disease caused by larval stage of the cestodes of genus Echinococcus. Humans serve as accidental intermediate hosts with no role in the biological cycle of this parasite (1-3). The most commonly involved organs are liver and lungs where more than 90% of the CE develop. However, almost any organ of the body may be affected (1). Cystic echinococcosis of the soft tissue is rare even in endemic areas (4). Formation of CE within muscles is not easy probably because of the muscles’ contractibility (5). Among the isolated sporadic cases of inter and intramuscular CE recorded in the literature, propensity for trunk and the root of limbs are seen, probably due to the higher vascularity and lower activity of theses muscles (5). 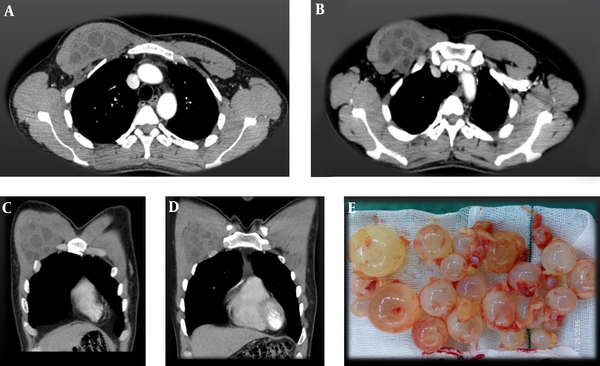 In this paper, a rare case of CE is presented, which was located in the right pectoral region. A 40-year-old male was referred to the surgery clinic of Alzahra hospital, a tertiary center in Isfahan University of Medical Sciences, Isfahan, Iran, with a swelling over right side of his chest in September 2015. He had experienced the swelling during the past year and he also mentioned that the swelling gradually increased in size. The patient had no associated symptom. He came from a rural area and worked as an employee in a steel company. However, his father was a cattle rancher. He had no history of recent drug usage or smoking. No history of trauma or surgery was declared. He was not ill or toxic. Vital signs and general examination were normal. In physical examination a nontender soft bulging in depth of the right pectoralis major muscle without any skin manifestation (eg, erythema or warmness) was noticeable. Ultrasound study showed a multilocular anechoic lesion in the depth of right pectoralis muscles with no vascularity. The contrast enhanced thorax CT scan (a 64-slice multidetector CT) showed a multicystic mass lesion between the right pectoralis major and minor muscles with extension beneath the pectoralis minor muscle (Figure 1). Cystic echinococcosis was considered as the first diagnosis. In this thorax CT scan, no concomitant lesion in the lungs was seen. The ultrasound study of the liver was also normal. Complete blood count and the coagulation tests were within normal limits. Figure 1. A - D, Axial and Coronal Contrast-Enhanced CT Scan of the Chest Showed a Multicystic Mass Lesion Between the Right Pectoralis Major and Minor Muscles with Extension Beneath the Pectoralis Minor Muscle; E, Multiple Daughter Cysts After Resection of the Chest Wall Mass. The patient underwent a surgery for resection of the mass. After dissection of the pectoralis major fascia, a large cystic mass was visualized just beneath the muscle with some adhesion to the chest wall. During our effort for complete inoculation, the cyst wall was torn due to its posterior adhesion. The fluid content was drained by the suction and then multiple daughter cysts and a germinal layer exited (Figure 1). The rest of the cyst wall was shaved from the thorax as possible. A hemovac drain was placed in the site of the surgery because of a large space created by cyst resection. The histopathological study of the cyst wall revealed an outer acellular laminated layer surrounded by inflammatory cells, and an inner layer with a nucleated germinal layer of epithelium, compatible with the diagnosis of CE. After discharge from the hospital, the patient was administered with albendazole 400 mg orally twice daily for 28 days. This 28-day course was repeated after 14 days without treatment to a total of 3 treatment cycles. He did not experience recurrence during our 6-month follow-up. Formation of CE in soft tissue organs is unusual and may challenge the diagnosis. Various features include the unilocular cyst, unilocular cyst with multiple daughter cysts inside or detached membrane, and calcified cysts may be seen. Edema and inflammatory changes of adjacent soft tissue is also possible, although not common (3, 6). Intermuscular and intramuscular CEs have been occasionally reported in the literature (4, 7-9). Indeed, this form of CE is considered as a rare and challenging entity even in endemic countries. Mohindra et al. described a case of multilobulated CE in the supraclavicular region within the anterior and posterior scalenus muscles with extension beneath the deltoid muscle (7). Singla et al. reported an intramuscular CE within the pectoralis minor muscle (8). Drimousis et al. reported a recurrent hydatid cyst involving the left gluteal and iliopsoas muscles (9). Our patient presented with a swelling in the anterior chest wall. One could consider it as an abnormality originated from the breast tissue at first glance. In fact, CE of the chest wall may present as a mass-like lesion confusable with tumors, hematoma or breast pathologies. The diagnostic approach of CE of the chest wall is identical to that of other more common sites of involvement. Aspiration of CE has often associated with the risk of fluid leakage into the host circulation and consequent eosinophilia or anaphylactic reaction. The cross sectional imaging techniques including ultrasound, CT scan and MRI have improved our ability in the localization and characterization of CE more precisely. Serologic study is another diagnostic tool with the high sensitivity and specificity. However, its use is more favored in the follow-up of treated patients (5, 6). Surgical removal of CE remains the best treatment, which also provides the confirmation of primary radiologic diagnosis during the operation as well as through the histopathologic study of the specimen (6). In this patient, we administered albendazole after the surgery because of the spillage of cyst content in the surgical bed during the cyst resection. The strong point of this paper is describing a rare site of CE, which may challenge the diagnosis. The limitation may be lack of checking the serologic tests before the surgery. However, the radiologic appearance of this lesion was typical. This case reveals that CE should be considered in differential diagnoses of any chest wall swelling. Authors’ Contribution: Amir Hossein Sarrami contributed in the data collection, diagnosis of the disease, revising the draft, approval of the final version of the manuscript, and agreed for all aspects of the work; Mehdi Karami contributed in the diagnosis of the disease, revising the draft, approval of the final version of the manuscript, and agreed for all aspects of the work; Mehdi Sadeghi contributed in the data collection, treatment of the patient, drafting and revising the draft, approval of the final version of the manuscript, and agreed for all aspects of the work; and Behzad Haddad contributed in the data collection, drafting and revising the draft, approval of the final version of the manuscript, and agreed for all aspects of the work.